Flying femurs hoisted my cocky core into a prop plane the size of a mosquito. Propellers started spinning, echoing beats of my excited heart. Myself, a photographer, pilot and human tandem backpack boarded the can for a skydiving adventure. Legs extended excitedly on the floor anticipating an incredible mission, as the aircraft door shut, tightly. Within moments, the nose gear lifted off our beautiful earth. Was this the last time I saw her in a cohesive piece? It was 2005, time to accept that potential concept as I was about to risk my life for an 8 minute adventure, above the state for lovers. The arm in my altimeter fashion accessory wrist watch climbed by the thousands. We peaked at 11. My human backpack clasped carabiners onto my cool uni, the door suddenly flew ajar. Shock hit my system like an adrenaline iv. All would be okay though, thanks to my cranium protector beanie cap. Right?! Confidence subsided, facial tones turned white as the clouds, like a chameleon matching her environment. The photographer plunged from the aircraft and hung, dangling by his phalanges off the strut. My tandem buddy crouched over peeking out, crumpling my uterus like a paper airplane. Over decibels of the engine, he yelled for me to shimmy to the edge of the open door. This had all been fun and games until now. My friend; crazy kilt, had invited myself and his buddy to drive from Pennsylvania to Virginia to jump out of a plane. I didn’t hesitate, I was fearless. I was in college, hear me scream roar! I rode in the back of his convertible, wind whipped through my hair as I belted to my beloved Dave Matthews. Hours later we arrived in a rural field in Virginia, nothing for miles but a single hangar. My torso inched toward the edge of the world, no time for tea to rethink this decision. My hands grabbed the side of the plane, holding on with all my might. My legs dangled, I gasped for air, it was horrifying! I would have sat there, frozen all day, but my pack man pushed us out and away from any tangible footing of safety, sanity and comfort. 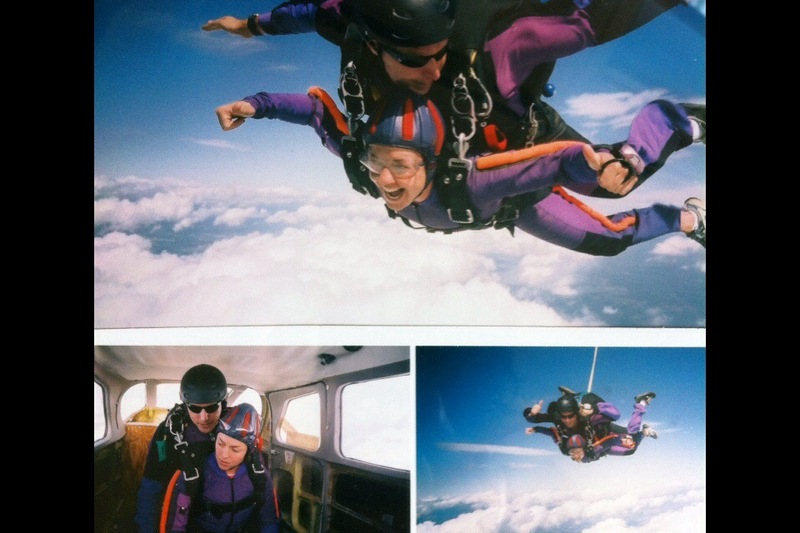 My next moment of awareness, we were free falling at 110 MPH!! After catching my breath, it was a dream come true to soar like a bird. It was stunning. I laughed, I screamed, I swallowed puffy clouds. Facial muscles wrinkled in the wind. I was in heaven, figuratively and literally. My backpack buddy pulled the pretty important cord yanking my legs to my chin, folding me like a taco. It hurt, but the chute opened slowing our free fall. All became quiet, and peaceful. We could hold a conversation. My lifesaving pack man pointed into the horizon asking if I could see the Tower of London. For an instant he had me inquisitively peering, then belly laughing. He braced the impact as we touched down upon familiar soil. I was in shock, astonished. I did a celebratory dance.